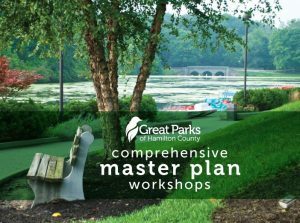 Please join us for one or more of the four upcoming community events for the Great Parks of Hamilton County Comprehensive Master Plan. The events are “Open House” style. Please attend at your convenience and stay as long as you like! Based on planning analysis, national trends data, local comparison, and community engagement to date, several high-level strategies and community priorities have emerged. This next step is to share these findings with you to hear your comments, questions and preferences. Your feedback will inform the draft plan recommendations that will become the heart of the final plan. We need to hear from you to make sure our strategy for the future considers your needs, ideas and priorities for Great Parks. In the four upcoming engagement sessions, you are invited to meet the planning team, learn about the Comprehensive Master Plan findings to date, and contribute your thoughts and ideas to the plan. The planning team will use maps, posters, and questionnaires to discuss the planning process with you and record your input. Each event will contain the same information and activities—so choose the location and time that is most convenient to you. If you were unable to attend a workshop or if you have more thoughts, click here to participate in the online workshop.